Brillio is a global business solutions company focused on big data, analytics, and digital technologies. We partner with companies to identify points of differentiation that will help our customers inform change that really matters to their businesses. By leveraging these emerging technologies, we are able to drive business improvements today. Automated Testing for the Digital Enterprise - The New Know-How! Companies globally are challenged to cope with growing complexity, accelerating business agility, and increasing dependency on digital. Today’s ‘zero tolerance’ markets demand responsive, anywhere-accessible software applications that do it right the first time and every time. Testing becomes key to meet quality expectations in increasingly complex modern systems. The question is - How do you test quickly and effectively in this complex milieu? There are many parts to the answer, but automated testing is key. 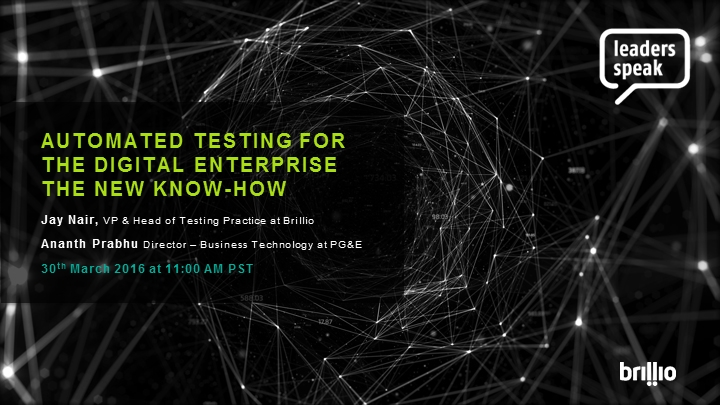 Join Jay Nair, VP and Head of Testing Practice at Brillio and Ananth Prabhu, Director – Business Technology (Enterprise Content Management) at PG&E, as they discuss the latest approaches and tools for automated testing and how you can use them to transform your business!